Sesame Sunflower Crunch | Cooking Component | Naturally. When it comes to textures, I’m all about the crunch. This is why I gravitate towards chips, crackers, and granola. 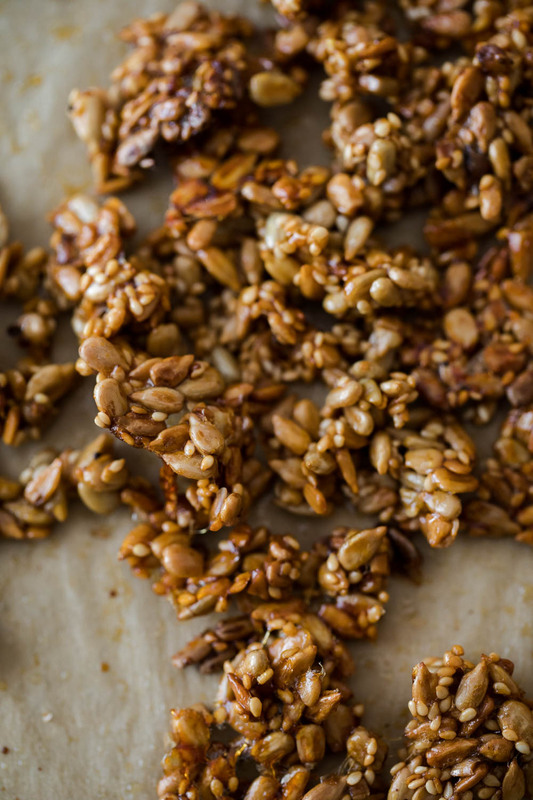 This sunflower crunch is a mix between toasted nuts and granola. 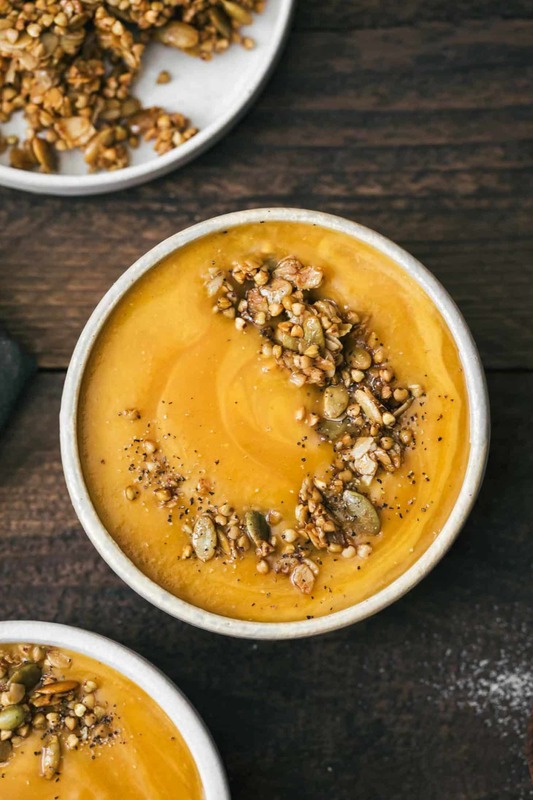 It’s simple on ingredients but the end result is a multi-use mix that adds the perfect crunch to soups, salads, and yogurt bowls. One of the things I love about this mixture: it doesn’t compete with grains. It can help add a boost to your morning oatmeal or lunch grain bowl without competing with the grains (like a traditional granola would). Be sure to check out the variations. There are many different directions you can go with this simple component recipe. 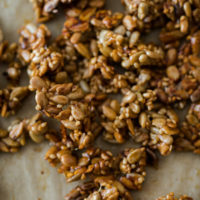 Nuts/Seeds: You can really use any type of nut/seed in this recipe but keep them small. Pecan or walnut pieces, crushed hazelnuts, and almond slivers work great. Sweeteners: I used honey but if you want to keep this vegan, I highly recommend brown rice syrup. The brown rice syrup really helps the sesame seeds coat the sunflower seeds. Spices: Take this mix sweet with a bit of cinnamon or cardamom or try a savory rendition with a small bit of cumin, coriander, or even chili powder. 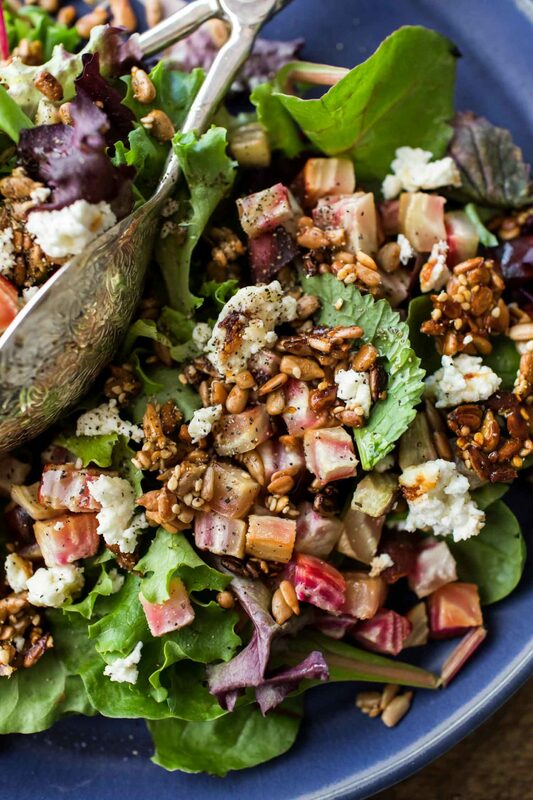 Salad: Toss in with your favorite salad recipe to add a bit of crunch. I like to replace croutons with this sunflower crunch. Soups: Similar to the salad, replace your normal crunch soup topping with this sunflower crunch. Use the spices to help add the perfect flavor boost. 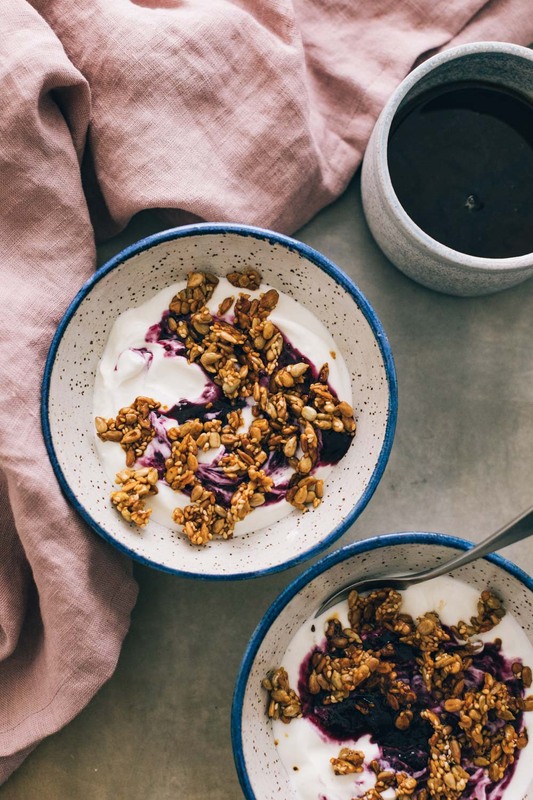 Yogurt Bowls: Use this sunflower crunch in place of your morning granola. It’s perfect with a bowl of yogurt and fruit. 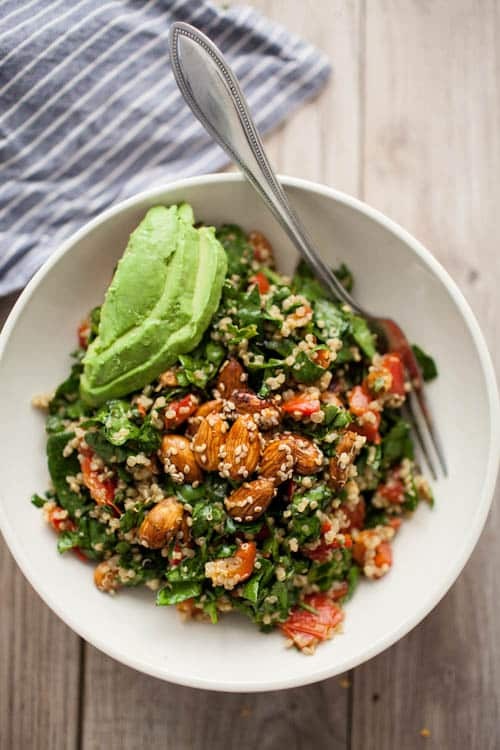 Grain Bowls: Add as a topping to a grain bowl with vegetables and sauce. Crepes: Use in sweet or savory crepes to add one more layer of texture. Snack: I’ve been known to eat it as is for a great afternoon snack. In a bowl, combine the sunflower seeds, sesame seeds, honey, olive oil, and salt. Toss until well combined then place on a separate piece of parchment paper. Place the tray in an oven that is at 400˚F and let the seed mixture crisp for 6 to 8 minutes. Remove the seeds from the oven and let cool. The mixture will still look quite liquid when you pull it from the oven, it’s okay. The mixture will crisp more as it cools. After about 10 to 15 minutes of cooling, break the mixture apart and let sit for another 10 to 20 minutes. Tips + Tricks: Watch closely- this mix bakes fast! Also, some people have mentioned this mixture is overly sticky. This mixture is best eaten right after it cools. As it sits, it will become stickier. I’m confused, the instructions talk about blueberries. Updated- something crossed wires in a couple of recipes. I saw this on your insta last week and had to make it! It was amazing, I ate it straight off the pan. I need to make about three times as much next time! Made this last week. It was quite tasty but super sticky. It definitely wasn’t easy to sprinkle over my yogurt. The next morning it was in one solid chunk. I might try making uit again with less honey. Hi Paige- So, I think what it is: I didn’t write a note about what happens when it sits. I remade it this morning and dropped the honey down to 1 teaspoon. I think this should help with the stickiness! Just made this and, like Paige said, it was very sticky, tasty but so sticky! I was looking to make this as a Christmas gift, can you tell me how long it will last in a jar. Hi- it’s not really good for that. It looses crunch fairly quickly after.